Aw, shucks. Let me just tell you the point I’m trying to make. This soup is ridiculously good. And has ridiculously few ingredients. 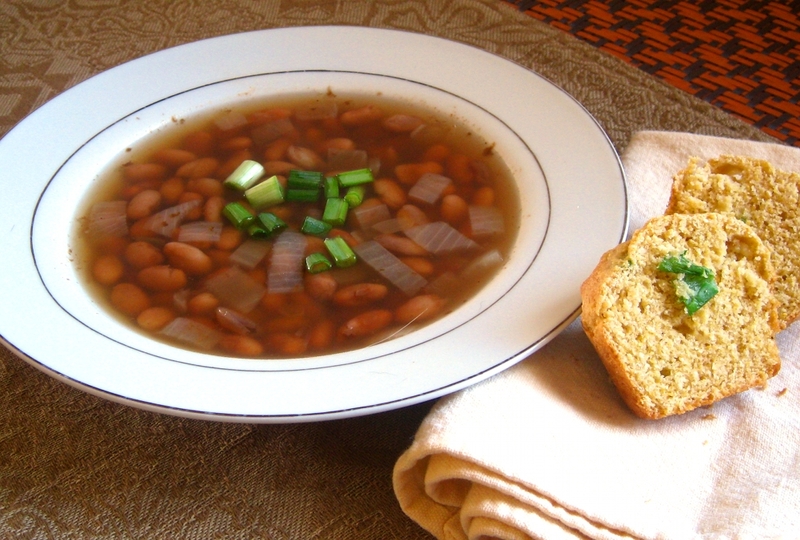 Yeah, it’s more or less a bowl of beans with an occasional onion (and if you are the Omnivore, bacon, too), but for some reason, it is tasty. I know what you’re thinking. Can I sub canned beans? I’m going to go with NO on that one. There’s just something synergistic about eating the beans in the broth that cooks them that you gotta have. It’s the bean juice. Magical bean juice. But I promise. It is not hard to make beans from scratch. I know you screwed it up last time. I know you tried really, really hard and cooked that blasted Mexican Chili forever, only to bite into a starch black bean. It won’t be like that this time. Trust me on this. Just follow the recipe. Don’t get fancy on me. Add beans to a large pot and cover with 2 inches of water. Bring beans to a boil stove top. Boil hard for 5 minutes, then remove the pot from heat and cover. Let stand 10 minutes. Go pet your dogs. Drain water. Combine the remaining ingredients listed above in a crockpot. Cook on low for 8-9 hours or high for 4-5 hours. Make some cornbread to go along with this meal. I love, love, love pinto beans. They’re one of those things that are definitely worth making from scratch every time.